THE work of the Church of Melanesia is more and more being done by the Melanesians. The proportion of native to white clergy is now (1950) almost ten to one. There should be at least three other white clergy but that is the position. The training of teachers and clergy cannot be treated separately as, up to a point, it is identical. Indeed, in this connection the educational system of the Mission must be considered as a whole. 1. Village Schools. These are attended by both boys and girls and are in the care of a native teacher. Ideally there is such a school in every Christian village. 2. District Schools. The best boys from the villages come on to these. They serve an island or an area and are generally within easy reach of the boys' homes. 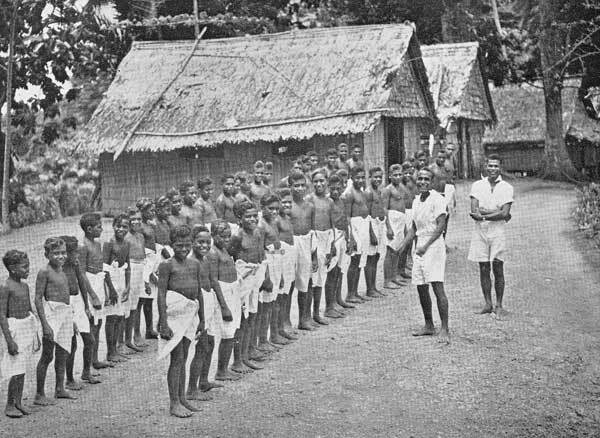 A native teacher is in charge and is under the supervision of a Melanesian priest. The people build these schools and supply the food for the scholars, either by direct gifts or by helping the scholars to plant the school gardens. Many of the scholars are able to go home at the weekends. 3. Native Junior Schools. Each large island, or group of small islands should have such a school. The boys pass from the District schools by examination. The schools are staffed by natives under periodic white supervision. Except for the supply of teachers and school material the maintenance of any school is the concern [3/4] of the island in which it is situated. The course lasts two years. N.B. At the time of writing one only such school is functioning, at Litogahira, Santa Ysabel. This, of course, is because of dislocation brought about by the invasion. 4. Preparatory Schools for Pawa. These are, at present, at Maravovo, Alangaula, Litogahira in the Solomons: at Vureas in the New Hebrides. The course is for two years and under full-time white supervision. If white staff is not available Melanesians carry on. 5. The Senior School. 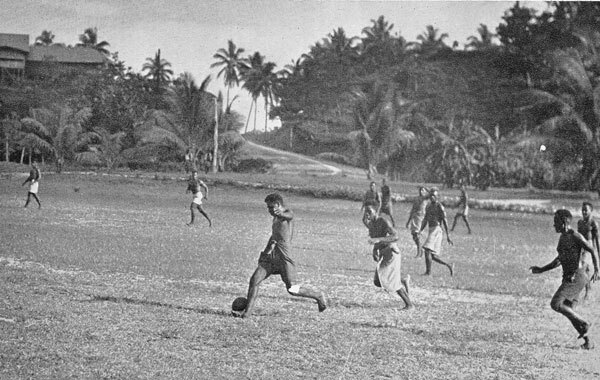 All Hallows', at Pawa in the Solomons. Entrance is by examination from the preparatory schools. The course is for three years. In the past most boys passing out of Pawa became junior teachers, or they joined the Native Brotherhood. Latterly, since the opportunity offered, some have gone on to the Native Medical School in Fiji and have qualified as Assistant Medical Practitioners. Others have become radio operators after a further course in a Government school, and some have attended courses in agriculture. A few have gone on to educational and theological schools in New Zealand. Two did a theological course Brisbane, Australia. These latter, are so to speak, brilliant exceptions. Others having ended the Pawa course become District School teachers. 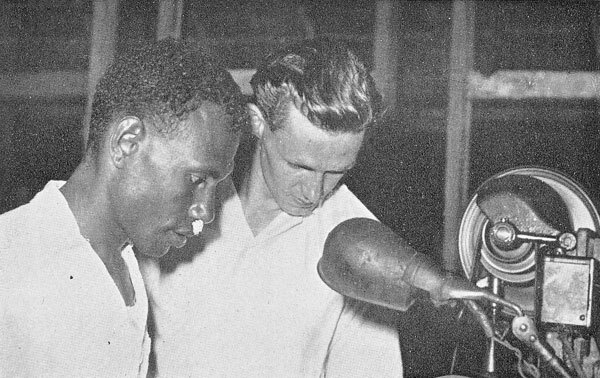 Later, after a time which proves their ability to lead, some are called to the theological college at Siota, Gela, Solomon Islands, and receive training for the Diaconate. Perhaps the inclusion of the syllabus for the final year's work at school may be of interest. There is not room to include that of the various schools. Religious Teaching. The Catechism, Prayer Book and Bible have been taught. Now comes the General History of the Church, Organization of the Early Church, Christianity and the Roman Empire, Christianity in Britain, the [4/5] Medieval Church, the Reformation and the Later History of the Church. English. Sentence structure and composition. Reading. Westward Ho, The Talisman. Writing. Lectures and note taking, writing up of notes. Advanced dictation from selected books. Grammar and Composition. Revision of grammar, rules of syntax, analysis of sentences, essay writing. Geography. Europe and Asia, Australasia. History. Expansion of the British Empire; History of the modern world; Great people -- Lister, Curie. Arithmetic. Elementary Geometry, Equations, Stocks and Shares, Ratio and Proportion, Exchange, Elementary Algebra, Elementary Trigonometry. Book-keeping. Drawing, Measure. Principles of surveying. Projects. Nature Study and Agriculture. Cattle-breeding, Milking, butter, killing. Construction of sheds. General farm management and routine. Copra and methods of preparation. General Knowledge. The story of gold. Debates, talks on world events. Modern Statesmen--Smuts, Chiang Kai-shek, Roosevelt, Stalin, Hitler, Mussolini. Civics. U.N.O., the British system of law and how it works. Science. Heat, Animal life, Light, Magnetism, Elementary Chemical theory, Plants, Animal physiology, Elementary mechanics, Electricity. Throughout the long years of Mission activity in these islands the standard of scholastic attainment, if such grand words may be used, has steadily risen. Each small reinforcement of the teachers' ranks has been a little better than the previous one and to-day the standard is [5/6] higher than it ever was--and this in spite of the set-backs due to the war. "Fall-in" for work 7.10 "
Work means manual labour in the gardens, plantation with the cattle, cooking, washing building, etc., etc., and ALL take part. The sick go to the Dispensary or school hospital. Afternoons are spent at cricket, football and other organized games. Boys are free to work in their own gardens and to swim or fish. Bed and lights out 8.30 "
On Saturdays there is no school and the boys are free after the houses and grounds have been cleaned and inspected. Lest we lose our perspective it will be well to recall the objective. There are "thousands and thousands [6/7] who wander and fall. . . I should like them to know there is room for them all and that Jesus has bid them come". When Christian people have to choose between a good thing and a bad thing, they are not likely to choose wrongly, but when they have a vital issue as to priority between two good things liability to error is increased. There is no doubt in anyone's mind, surely, that education, in its customary meaning, is good. Missionary societies are bound to educate, especially when working amongst an illiterate community, as a means to salvation. There is, however, a real temptation to magnify the sphere of education and thus divert missionary enterprise from its exclusive objective, viz., the salvation of mankind. Christ came "to seek and to save that which was lost" and missionary societies exist for no other purpose. Education and industrial activities contributing to that end must be readily forwarded, but, for the missionary it must be "thus far and no farther." Language. Each island in Melanesia has its own. On the larger islands three and even four may be spoken. This problem was faced right at the beginning of the work. 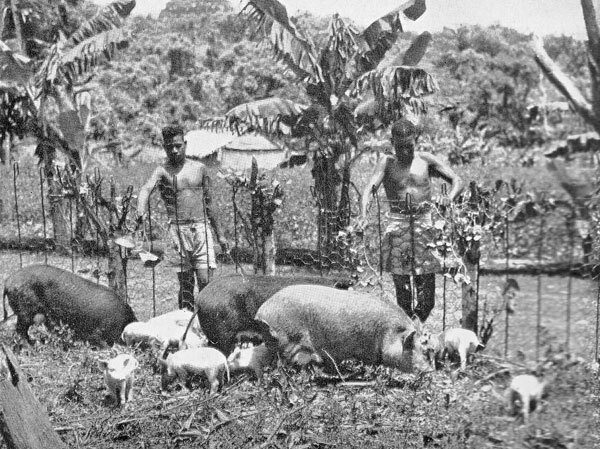 The language of the island of Mota was chosen to be a lingua franca, the "Latin" as it were of the Melanesian Church. There were several reasons why this language was chosen and not the least was that the Mota people very readily became Christians and the missionaries had easy access to the people. For years all the Mission people, brown and white, learned this language. Translations of many kinds were made. The Colleges and Schools did all their work in Mota and a Mota speaking person after a few years could find at least one other in all the villages of the Diocese. Some efforts had been made to teach English as a school subject, but, except for a few instances, this did not get very far. In 1930 it was decided that the language of the Central, i.e. the preparatory schools, should be English. The transition was made slowly and carefully, and now, the generations of school people that have grown up since, all speak and read English. The world of English books has been opened to them and it has become possible for men to go to schools and colleges in Fiji, New Zealand and Australia and to take full advantage of the opportunities. Also, it has enabled the people to talk to Government officials and other white residents, e.g. traders, on something like reasonable terms. It should be said here that in the villages, and the work amongst the island people generally, the tongue of the locality is used. School work and the services in the Church are in the language which all understand. There is something in print in thirty-four Melanesian tongues and translation work still goes on. The College. 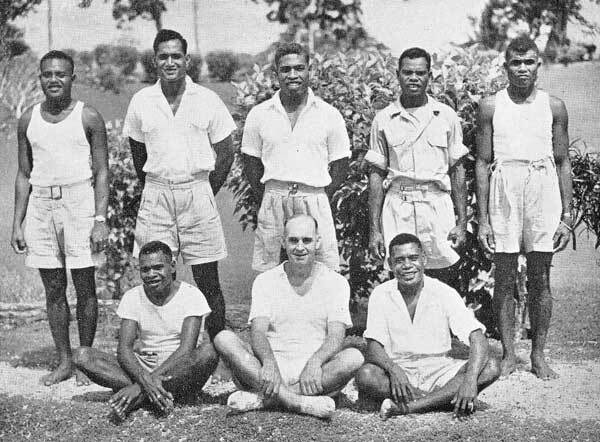 The Selwyn College at Siota, Solomons. In Melanesia we soon learn, if we did not know it before, that the location of a scholastic body, be it college or school, is unimportant. We learned that in England during the war when whole establishments were swiftly transported into other buildings and neighbourhoods. That kind of thing has happened in Melanesia. Selwyn College has been in many places, Maravovo, Siota, Maka, Taroaniara and now it is, we hope, settled permanently at Siota. Wherever it has been, in peace and in war it has gone on turning out the trained men for the ranks of the Melanesian clergy. The men. They are teachers who have given in active work and practical leadership, some proof that they are men of character and ability. The Bishop has called them in for further training. They are the ordinands. Upon occasion a certain number of teachers are called in for a 'brush-up" and they share the College with the ordinands at present. There will be from ten to twenty men in residence at a time; married men most of them and they will have their wives and children with them. Each student has a separate house. Bachelors live together in one larger house. The Cathedral is the spiritual centre of the College life. There is, of course, a daily Eucharist as well as the daily morning and evening prayers. The routine is very similar to that of a Senior school. There is a class in the afternoons and the men probably spend more time in private study than do the school-boys. Food for the College is grown by the students and their families and they do all their own cooking and housework. Rebuilding and repair work is also their job. The senior men are responsible for the routine of services in the Cathedral. 1. The clergy are licensed to minister to their own people. Normally, no other Bishop would license a native priest. NOT because his skin is brown but because his standard of learning is different (See note below). 2. Christianity is not a religion simply. It is a life. In the schools and college the aim is to train boys and men in a "WAY OF LIFE"--Christian life--and to impart as much learning as they are able to bear. By the time the Melanesian is called to the Diaconate he has had a good grounding in the Bible, the Prayer Book, the Creeds, the Sacraments and the Ordinal. He has some knowledge of Church History, and of the Church in other lands. He has had lectures on Pastoralia. He knows some English, but, ordinarily, has no Greek, Latin or Hebrew. He does know Mota, in which, for many the Holy Scriptures are written. He has had a long course in the Christian life. Whatever the educational [9/10] standard may be the Bishop "lays hands suddenly on no man, but faithfully and wisely makes choice of fit persons to serve in the sacred ministry." Melanesia's priesthood must be Melanesian. "Every confirmed Christian should have the opportunity, at least, of making a weekly Communion, that is to say, a Communion every Lord's DAY. Our communications are spread over thirty-six islands, some of which are more than one hundred miles long. We never have enough white priests, and I cannot conceive that we shall ever have, to give these people their Communions. I will go farther and say that I do not believe God intends us to have them. The vision we see is the vision of the Lord's own Service, on every Lord's Day, everywhere in Melanesia, and priests standing at the Altars are Melanesians." Other considerations are--the native priest can move quickly and easily about the country for he does not carry the impediments which a white priest must carry. He does not want to carry them but cannot avoid doing so because he is a white man. 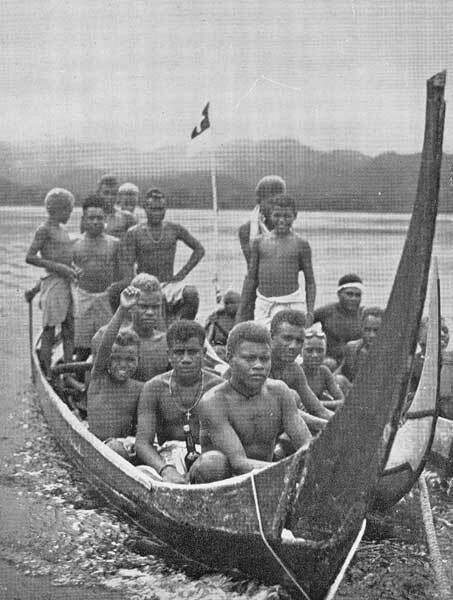 The native priest can live a life of simple equality with the Melanesians--such as we long to live but cannot. He has not the language difficulties such as we have. He knows the life and customs of the people to whom he preaches. He will not die or be invalided home so easily. The need of Melanesia is a native ministry. Our need is for the right men to train them--and, what a glorious work. Note written about a Melanesian priest who did a post-ordination course at St. John's College, Auckland, New Zealand. "I have been meaning for sometime past to let you know how your man is faring. He has fitted in extremely well and we have all grown very fond of him. The men [10/11] all respect him and call him "Father". He takes his full part in the College life and is, I am sure, benefiting by it. He is most keen to learn all he can both inside and outside the College during his stay. He attends lectures and from talks I have had with him he seems to take in quite a lot. In Chapel his devotion is an example to us all. I get him to Celebrate occasionally and he does so most reverently. Last vacation he was sent with another student to give the Sacraments in a district which had been without them for some time and the Bishop has given him a General Permission to officiate in the Diocese. . . . I may add that he is most polite and well-mannered and an example to the men in this and other respects. Whatever benefits he may derive from being with us, I am sure it will have been of great benefit to the College to have had him. Books to Read. Heathen Boy to Christian Priest, 9d. 1. What is the primary purpose of education in the Mission field? 2. Does this preclude other purposes? 3. 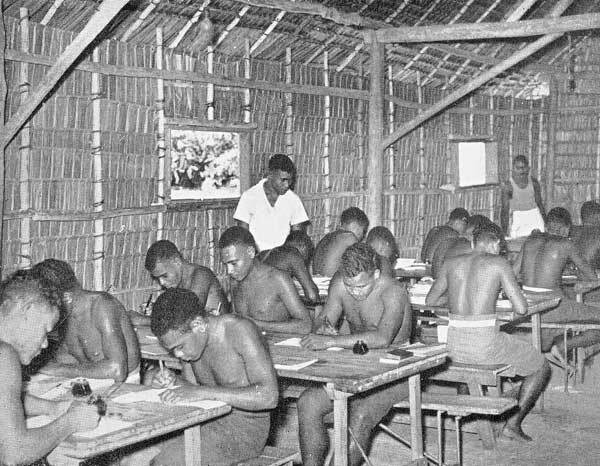 What are the reasons for the particular arrangement of schools in Melanesia? 4. What is a village teacher? 5. How is the difficulty of a variety of languages overcome? 6. Name the theological College of the Mission. Why do you think it is so named? 7. Is it desirable to have a large number of Melanesian clergy? 8. What ought to be the chief work of the white staff? 9. What happens to schoolboys who don't become teachers? 10. What proportion of white to native clergy are there?